Psycho may be a weird title for a film. That deterred me initially to listen to the songs of Psycho, a Kannada film. But well, when the one of the songs from the movie, ‘Ninna Poojege Bande Mahadeshwara’, became popular and was frequently played in FM channels in Bangalore, it caught my attention. When I listened to all the songs from this movie, I was surprised at all songs being too good, as it is a rarity nowadays. The album seems like a perfect combination of lyrics and music in all the songs. Psycho is mostly a newcomers’ venture – with Devadatta directing the movie for the first time and Raghu Dixit giving the tunes and lending his voice to few of the songs. But on the lyrics front, it is the veterans of the industry who have penned their thoughts and emotions. Jayanth Kaykini, top Kannada lyricist now, has wrote 3 songs for the movie – Beladingalante Minu Minuguta, Eno Ide Ee Preethili Eno Ide, Preetiya Manashantiya Siri Honnina Naadidu. R N Jayagopal, one of the famous Kannada lyricists, who passed away recently, has also written a song for the movie – Mussanje Rangalli. Lyrics of the most famous song of the movie, Ninna Poojege Bande Mahadeshwara is penned by V Manohar and Raghu Dixit. A Class Apart : Psycho marks Raghu Dixit’s debut as music director in Sandalwood and it has been rocking. Ee Thanuvu Ninnade Ninnane is composed on western tunes and haunts you after you listen to it. On the contrary, Mussanje Rangalli is on Indian classical tunes and Saindhavi singing the song – perfect match! Beladingalanthe Minu Minugutha is a slow, melodious track. Eno Ide is a sad song echoing the emotions of a dejected lover. Preetiya Manashantiya is a song describing the greatness of Karnataka. 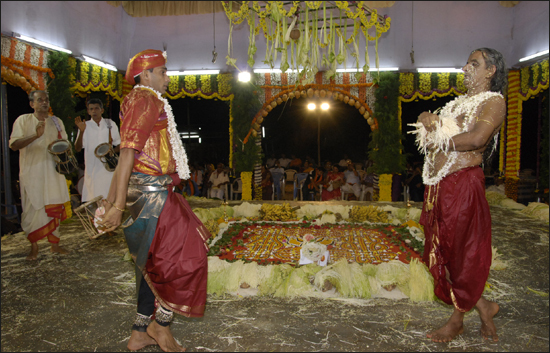 Most songs about Karnataka or Karunaadu in the past emphasized more on the past glory and were fast tracks. Here, this song does not focus on the past glory but on the common man of Karnataka and melody of the song reverberates in your mind for a long time. Of course, not much to tell about Ninna Poojege Bande Mahadeshwara, as you would have already heard, read enough about this song. Film has already generated curiousity among the movie buffs. Cast of the film is not disclosed yet. Trailor of the movie looks impressive. I am eagerly waiting for the movie to be released. Are you? To listen to the songs of the Kannada movie, Psycho click here. "Ee Thanuvu Ninnade Ninnane is composed on western tunes and haunts you after you listen to it"
Kannada saryaagi barOvru ee haaDu kELdre takshNa vaanti maaDkOtaare!!! ashTu asahyavaagide ucchaaraNe..
Music is good, I accept but since its western tunes you cannot alter the pronunciation of the words itself. It applies to any type of music, whether it is carnatic/hindustani classical, sugama sangeeta(light music), film music. Its like an Indian speking English in US accent which many times makes so irritating to listen. Probably for his western tunes music director should have selected one english song and he should have made one westerner to sing that song. If people starts appreciating this song because it has western tunes without caring about pronunciation many of our music directors will start defending Udit narayn's worst songs also. (Worst in the sense wrong pronunciation while he sings). Liking/Disliking of a song is an individual opinion. Anyway pronounciation fault is there in only one line - 'Nee Shaapa Kottaru' where he has dragged 'Koottaaru', other than that I dont find any other fault. Comparision to Udit Narayan's is out of place here, as Udit Narayan makes mistakes in pronounciation in most of the lines. Most famous line is from film, Nandi - where he sings 'Gatala daati banda' instead of 'Kadala daati banda'. liking / disliking individual opinion,I never commented about that. If people does not care about pronounciation, yes they may like it. Do you think "ninnade" pronounciation is correct?????? "aane kadroo kaLLa .. aDke kadroo kaLLa"
Both of them (raghu dixit and udit narayn pronounce kannada words badly). Udit may not know kannda well but i think this fellow (raghu) even after knowing kannada(i am not sure) intentionally pronounce it badly!!!!! "ninnade" is pronounced in a way, bit more than 'alpa praaNa' for 'nna' but that is compensated by 'ninnaaNe' where 'mahaapraaNa' for 'nnaa' is dragged. Purists may not like it. compensated??? likes dislikes???? I do not see any rationale in your argument!!! Wromg or not?? Wrong is Wrong for both purists and impurists!! it means to say that you can make distinguish between alpapraana and mahapraana in these 2 words - ninnade and ninnaaNe.